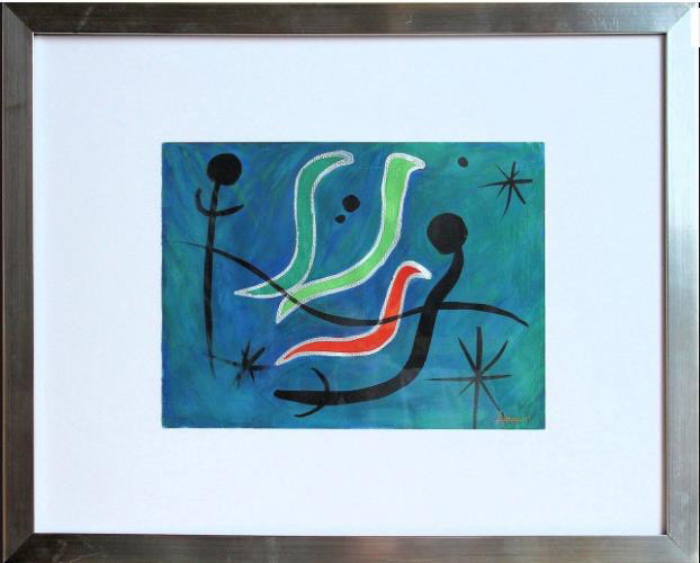 Watercolor inspired by my C. elegans dreams and after going to the Miro Museum. Guest post by Ahna Skop. 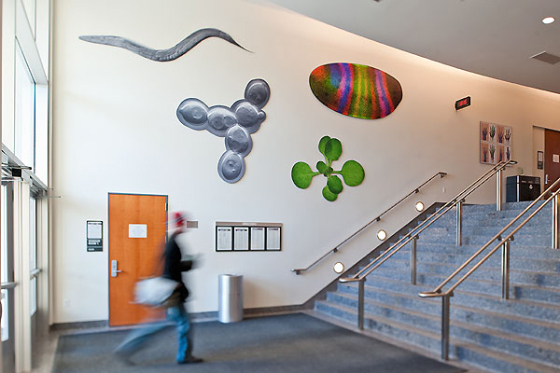 GSA-art features the creative works of scientists, particularly geneticists. Read more about the series from GSA President Stan Fields. If you would like to submit your own work or nominate someone else’s, please send an email GenesToGenomes@genetics-gsa.org with “GSA-Art” in the subject line. I love Caenorhabditis elegans first for its beauty and then for the science. Beauty inspires my curiosity to figure out how things work and is most likely why I ended up a cell biologist. I dream about C. elegans and mitosis all the time. I am always inspired by things people can’t see with the naked eye. I think nature is miraculous in design, texture, and beauty, even on the microscopic level. I especially love the textures I see from electron microscopic images and have often used them in my ceramic art pieces. But I take inspiration from other biological organisms and my colleagues often as well. Genetically I’m an artist. My father, Michael Skop, was a bit of a Renaissance man and was a classically trained fine artist who studied with Mestrovic (a pupil of Rodin) and also taught college-level anatomy. Actually, his middle name was Roe. Yes, that’s Mike Roe Skop. His high school biology teacher said his middle name should be Roe, so he got it legally changed (he didn’t originally have a middle name). His signature on his artwork included a small microscope. He operated an art school at our home studio for over 30 years, attracting artists, musicians, and philosophers from all over the world. My mother was a high school art educator and ceramicist and has dabbled in fiber art, sculpture, and painting. My two sisters and brother are also graphic artists. Growing up, I was surrounded by clay, paint, charcoal, wood, and we were always trying new things and meeting other artists and students doing a variety of amazing pieces. We didn’t have any boundaries and I certainly didn’t set any for myself as I got older. I attribute this to my parents nurturing my creativity. I think of myself as a big kid, always learning, discovering, and trying new things. I do just about everything, from graphic design, watercolor, ceramics, cakes, food blogging, and web design, to jewelry. If there is something I don’t know how to use or do, I usually take a class. My creative outlets are constantly changing which keeps me always learning and thinking. As well as creating my own, I have curated exhibitions of scientific art (TINY: Art from microscopes and the Cool Science Image Exhibition for the Macpherson Eye Research Institute). I am also an affiliate with the UW-Madison Arts Institute where I am able to mentor artists in my lab. You can see some videos of the art installed on our floor here. Logo for the 2005 C. elegans Meeting. My hobbies influence my research and teaching immensely, as they allow me to see things in different ways. During my undergrad studies, my development textbook showed the first confocal image of the mitotic spindle in a one-cell C. elegans embryo. This was taken by Tony Hyman on the very first confocal microscope that my future graduate mentor, John White, invented. I was smitten with the beauty of mitosis that day. I even circled the image and said I love this. By a twist of fate, John White moved to UW-Madison and I had the honor of working in his lab. And guess what I still work on? Mitosis and C. elegans embryos! Installation of scientific art I did in our department’s foyer. For this post, I am sharing a watercolor and three C. elegans meeting logos I created over the years. 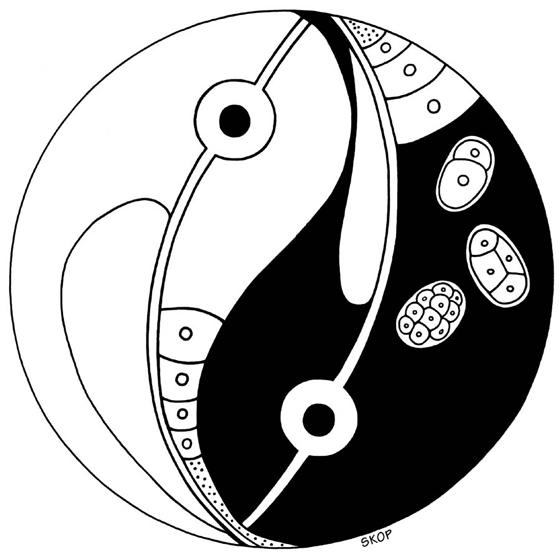 When I was a graduate student, my advisor, John White, asked me to make a logo for the 1997 International C. elegans Meeting, and the yin-yang logo is what I came up with. I’ve been doing the meeting logos almost every year since then. I have also organized the bi-annual Worm Art Show for the Meeting since I was a graduate student. I find logo design a rewarding and challenging part of my contribution to the awesome C. elegans community. It’s fun to think about what attendees will want to wear on t-shirts and abstract books; why be boring? The greatest thing is that there is a cohort of scientists who now collect my designs on t-shirts and they come to the meetings with a pair of shorts and an “Ahna Skop collection” of t-shirts in their luggage and tell me how easy it is to pack for the meeting! About the author: Ahna Skop is an Associate Professor in the Department of Genetics and an affiliate faculty in Life Sciences Communication and the UW-Madison Arts Institute at University of Wisconsin-Madison. Ahna is also a SACNAS and ASCB Minority Affairs Committee member, where she is passionate about the success of the underrepresented in STEAM fields. Her lab seeks to understand the molecular mechanisms that underlie asymmetric cell division during embryonic development using the nematode C. elegans as a model system.